A high-end machine with two dust collection inlets, a clever slide mechanism, and a front-mounted bevel lock. 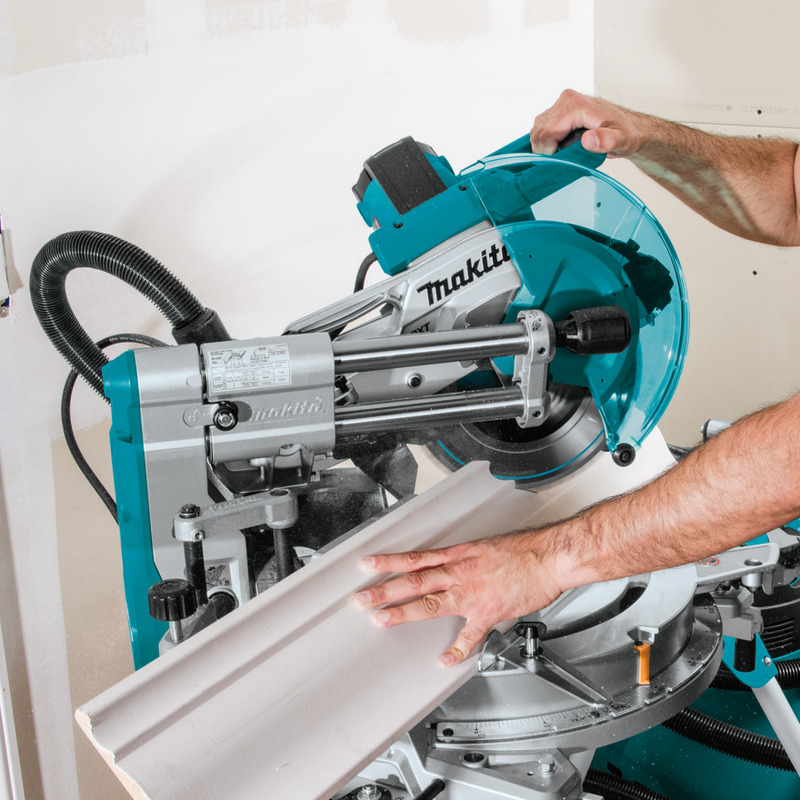 Makita recently announced the LS1019L, a new 10-inch sliding compound miter saw with cutting capacity similar to that of many 12-inch models. Among its more notable features are a dual inlet dust collection system, a bevel lock that can be accessed from the front, and a slide mechanism that allows the saw to be used against the wall. 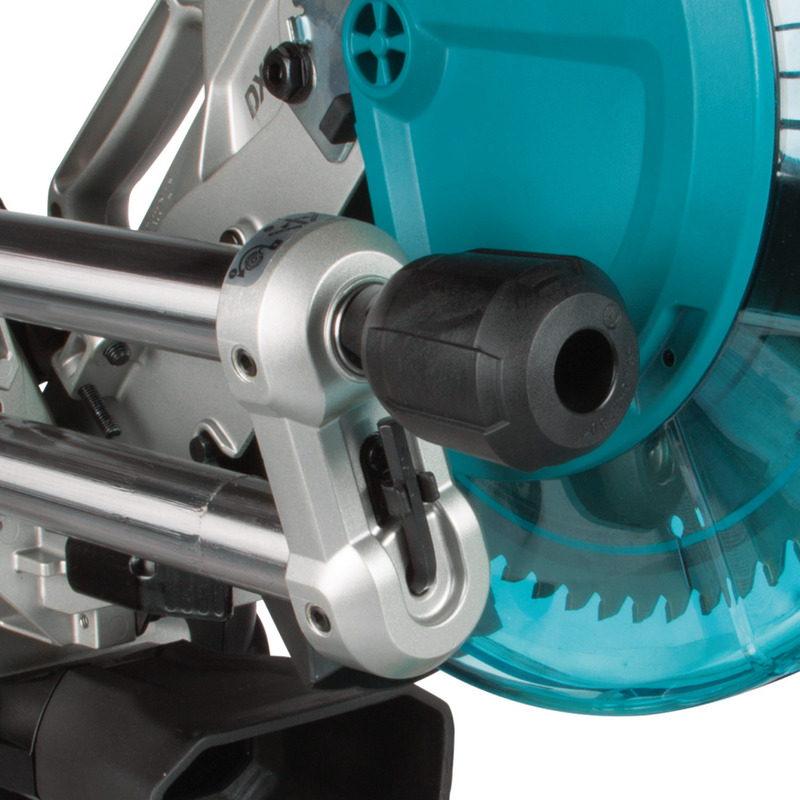 On most sliding miter saws, the motor is attached to rails that slide back and forth through linear bearings. This configuration prevents you from working with the machine against the wall because the rails stick out the back when the motor is pushed in. 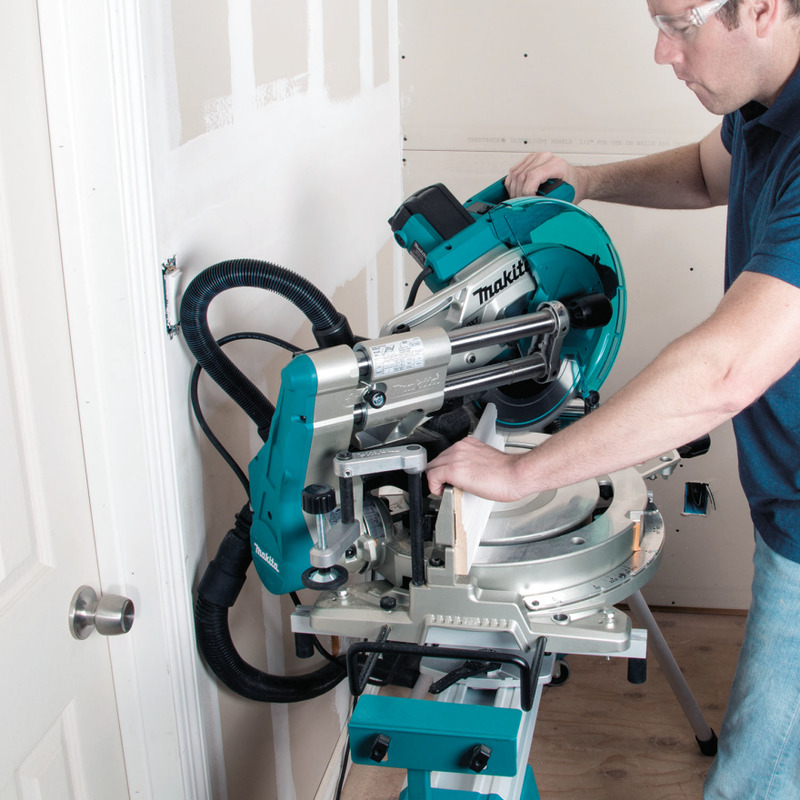 Makita's new saw can be used against the wall because because the motor slides back and forth on fixed rails. 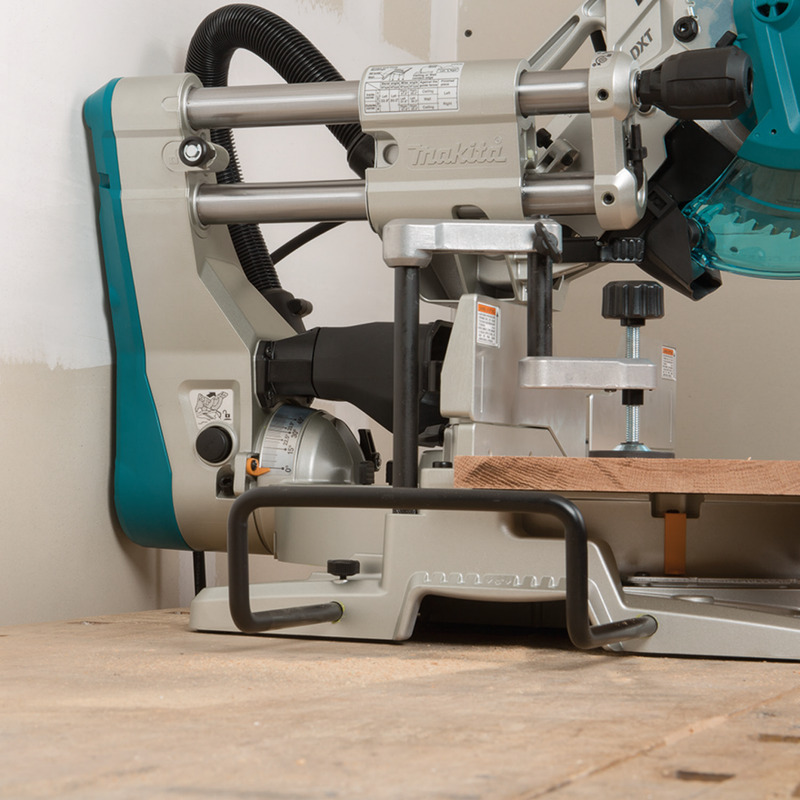 The only other slide miter saw with this feature is the Festool Kapex. As with the Kapex, a knob at the front of one of the slides allows users to change bevel settings without having to reach around back. 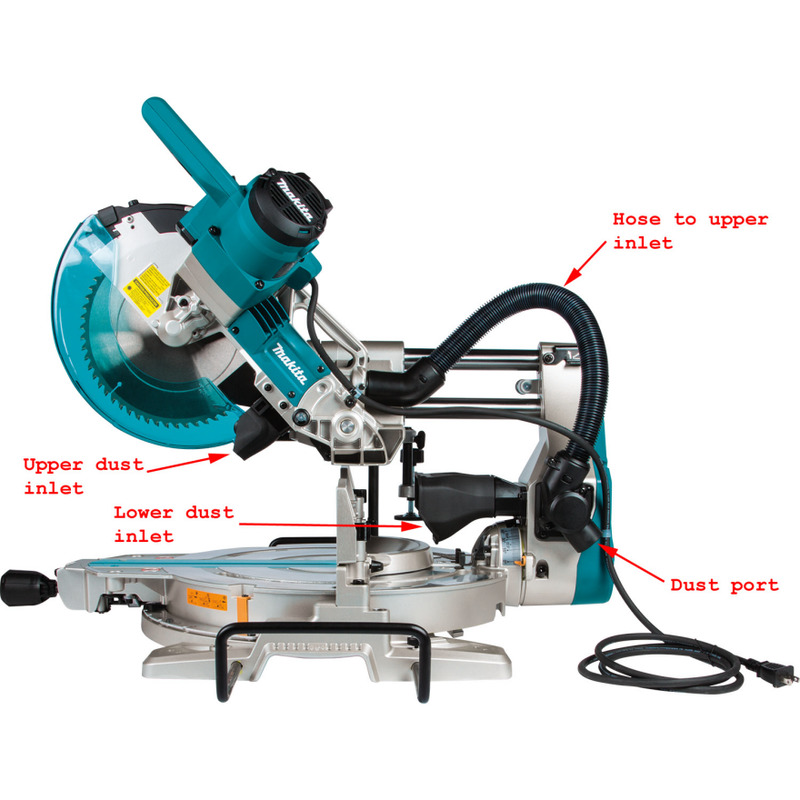 In order to collect more of the cutting dust, the saw has two inlets instead of the usual one. The upper inlet is in the usual place, attached to the motor housing behind the blade guard. The lower inlet is at table level directly behind the slot through the fence. A dust collecting vacuum can be connected to a port at the rear of the lower inlet, which connects by hose to the upper inlet. When working without a vacuum it's possible to replace the upper inlet hose with a fabric collection bag. Additional features include a laser cut indicator, table extensions, and an upper fence that removes for bevel cuts. The saw has a direct drive motor (geared all the way), so there's better power transfer and no possibility a drive belt will break. 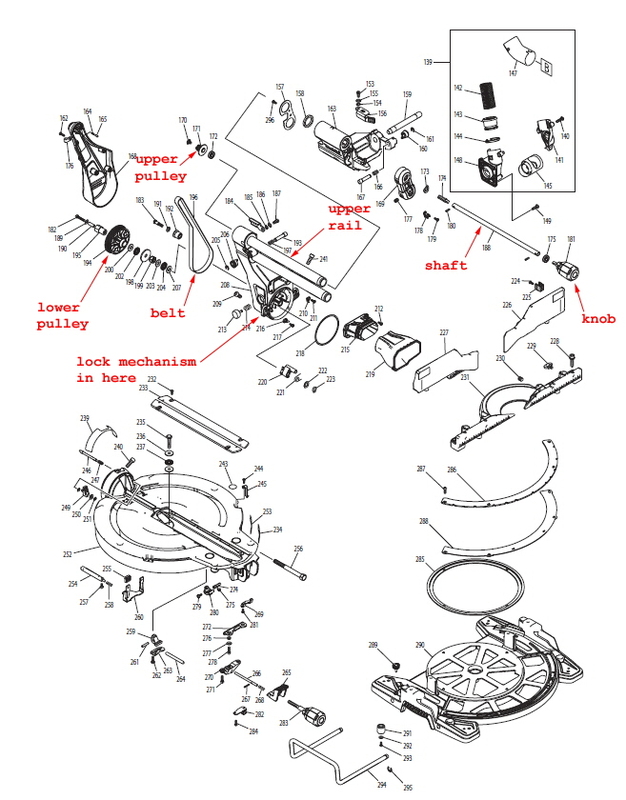 As the exploded parts diagram shows, there is a belt but it's for bevel lock. 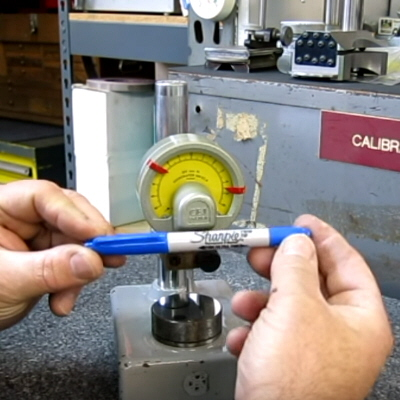 The lock knob turns a shaft inside the upper rail, which uses a belt and pulleys to turn the bevel lock mechanism below. How the bevel lock mechanism works. 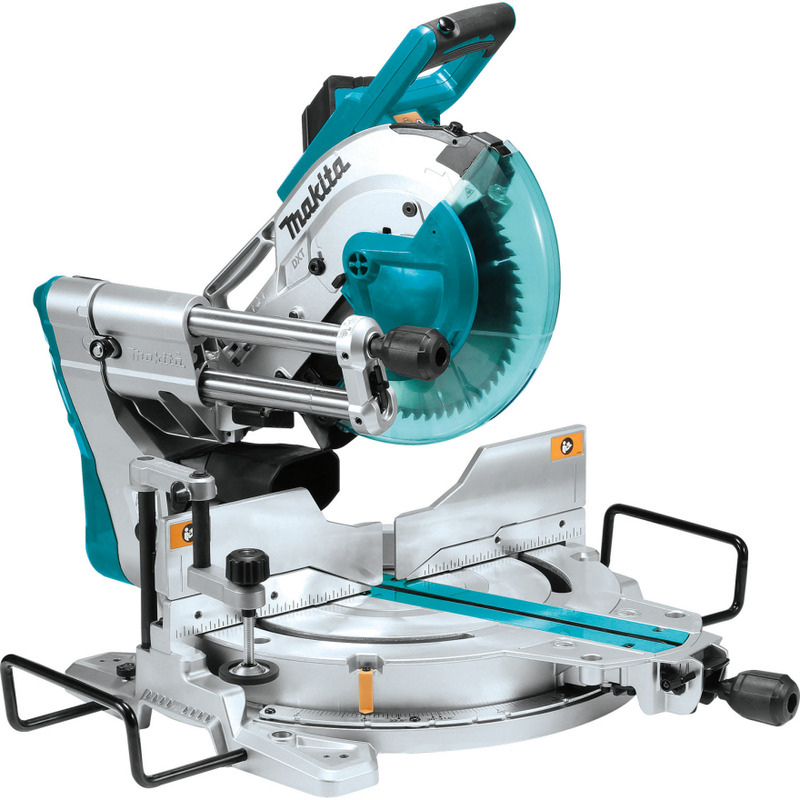 As for what the new Makita saw can do, it will cut 12" material at 90° and 8 1/2" material at 45° on the flat, 6 5/8" crown nested, and 5 1/4" material vertically against the fence. 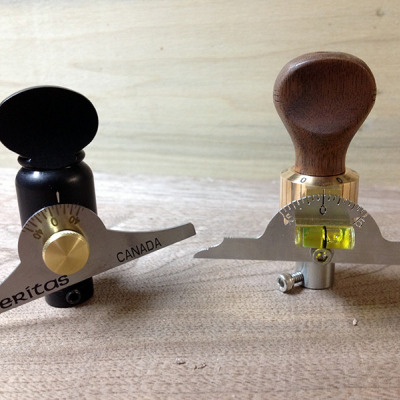 The saw miters 0-60° left and right and bevels 0-48° in both directions. The fixed rails and sliding motor are a throwback to the radial arm saw, which until the late 1980s was the machine of choice for wide crosscutting. It fell out of favor after the introduction of the sliding compound miter saw (SCMS), which was smaller, lighter, and safer to use. The SCMS could cut wide material—not as wide as could be cut with a radial arm saw but wide enough for the tasks performed at many shops and construction sites. I don't know why the first SCMS (an 8 1/2" Hitachi) had a fixed motor and sliding rails instead of fixed rails and a sliding motor. Whatever the reason, this configuration was used in every SCMS built for the next 20+ years. It was not until the introduction of the Festool Kapex and now the Makita LS1019L that we had sliding saws that could be used against the wall. It's a small thing, but it makes a difference when you work in tight quarters. David Frane is a tool nut who has worked as a carpenter, furniture maker, and journalist—with a special interest in how, where, and by whom things are made. Dewalt DW700/DW707 based on the old Elu design had fixed rails and could almost be used against a wall. Thanks for this. 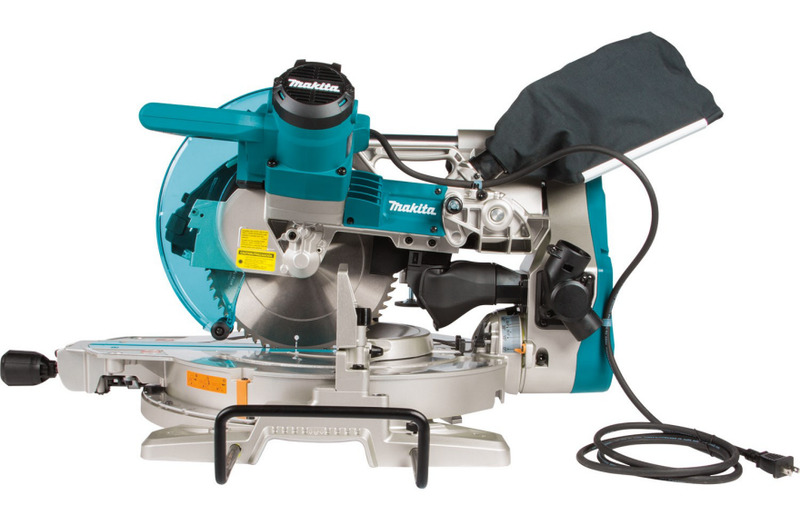 I've been looking for a mitre saw upgrade for my tiny workshop, and this is definitely one to add to the list. FYI, both Bosch and DeWalt also offer saws with articulated arms rather than glide tasks, which solves the same problem in a different way. This saw looks extremely promising, the dust collection especially. One nitpick about the article, tough. Festool isn't the only company that has made a sliding miter saw with fixed rails... Craftsman did as well (Model # SM2509RC). The reviews on it were so-so, basically saying at the price point the flaws were acceptable. Thanks Creighton. I used to work with a carpenter who had a Craftsman machine that was essentially a miter saw size radial arm saw. I went looking for that on the web but could not find photos because it was from before the internet. Can't believe I missed seeing this newer model from Craftsman. How Thick is the Line from a Sharpie? 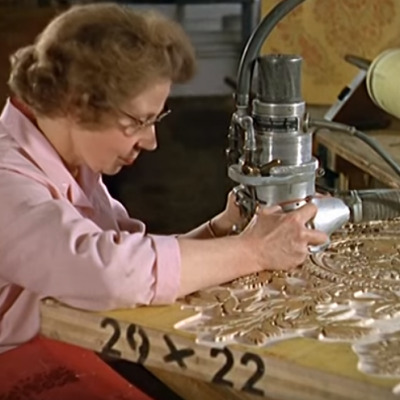 This Pathé film shows how high-end wallpaper was once made in the U.K. Behold the Wonder of the Wooden Wagon Wheel! 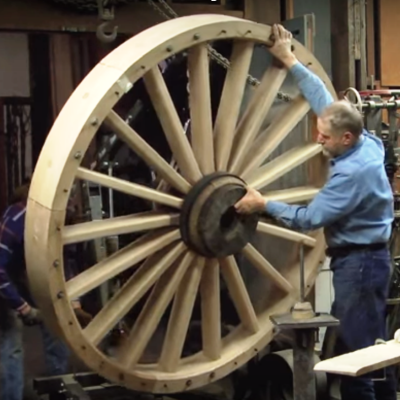 See modern-day wheelwrights fabricate this surprisingly sophisticated component of a 20-mule team wagon.